A Slice of Smith Life: Celebrating St. Nicholas' Feast Day! One of the joys of being a Catholic is the gift to celebrate so many wonderful feast days, especially during the month of December. For a list of all the lovely feast days in Decemeber with great links, be sure to visit Jessica's post HERE at Shower of Roses. Not only does our family get to anticipate the celebration of Jesus' birth at the end of this month, but during Advent, we remember some of the lives of those that have been holy role models that have passed on our faith. On December 6th we celebrate the feast day of St. Nicholas, a favorite saint in our home. Who is St. Nicholas? Find out more HERE. If you would like to know more about St. Nicholas and the origin of Santa Claus, click HERE. A great link for tons of great information about St. Nicholas, be sure to visit St. Nicholas Center (dot) org. It is a tradition in many households to set out your shoes by the fireplace or door so that St. Nicholas will leave small treats in the shoes to represent how St. Nicholas long ago showed God's love to others by leaving money for those in need. We have our shoes ready by our fireplace again this year. Here are our shoes from a few years back that were filled with chocolate gold coins and candy canes. The candy canes symbolize St. Nicholas' staff that he carried as Bishop of Myra. This year, my children will receive this Playmobil St. Nick and Angel set that I found at Catholic Child and a new nativity from Catholic Child as well. They will also find their gold chocolate coins covered with pictures of St. Nicholas that I printed from Shower of Roses. Last week our homeschool group got together to celebrate the giving spirit of St. Nicholas by assembling 25 Christmas bags for children who are in poor housing conditions or homeless. The students in our group stuffed the bags with packaged cookies and candy, pencils, religious Christmas stickers, and a small Nativity set. We also collected gently used coats to donate to children and adults who are in need of them this winter. Here are some pictures of our homeschool group honoring St. Nicholas' giving spirit. 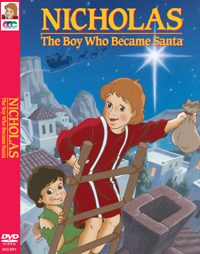 Another fun way we celebrate and remember how Saint Nicholas shared God's love is by watching a CCC DVD titled, "Nicholas, The Boy Who Became Santa". My family loves the CCC company and their award winning animated films DVD collection. We have all their Saints and Heroes DVDs and my children watch these short and inspiring stories over and over again! I enjoy watching them too and I'm learning so much about our faith along with my children! I highly recommend CCC as an excellent resource for teaching our faith to children young and old! It is a blessing to be able to tell my children about St. Nicholas and focus on the sacredness of this joyous season vs. only knowing the secular side of Christmas, which is more about getting vs. giving. and taught the truth to all. by putting you first in all we do. our brothers and sisters. Amen. Check out how other bloggers celebrate the Feast of St. Nicholas by visiting Jessica's post HERE at Catholic Cuisine! I am linking this post to No Ordinary Blog Hop where bloggers have the opportunity to share how they can touch lives one gift at a time! What a lovely idea for celebrating this generous saint- to give those gift bags and warm coats. That might be something our group would be interested in doing! Thank you for sharing that. Happy Feast of St. Nicholas, Tracy and family! What a great idea to assemble bags with your homeschool group - thanks for the great post! All of my friends were from faithful Catholic homes. We had so much fun celebrating the feast days in December. St. Nicholas feast day was always our favourite! Their church group always found a wonderful service that we all participated in. What good memories! Nothing like yours, though. What fun! And what a teaching moment for your wonderful children! Thank you for being the dedicated, faithful person you are! And for raising your children to be the same! Happy feast of St. Nicholas to you and your family! Thanks so much for all the links..they help me! Merry Christmas! Hope you and your family enjoyed celebrating the Feast of St. Nicholas Tracy!! Thanks everyone for your visit and comments! I hope all of you had a blessed day celebrating such a great and remarkable saint! God bless! Hi Tracy, I thought I saved your email but cannot find it ;( Anyway, I have that recipe. When you have a moment, email me again (sorry) and then I'll send you the recipe for that yummy candy cane coffee cake. Our HS group celebrated last Friday-- I think I will be keeping your groups gift bags for the needy in mind for next year! Such a perfect way to honor this Saint! Thank you for sharing! Hello! I just came across your blog today and there are so many great ideas. Thanks for sharing and Merry Christmas!